The Water Authority will be working within the First Aqueduct to rehabilitate sections of pipelines 1 and 2 and repair or replace aging structures beginning in Fall 2018. The project will extend the service life of the pipeline and eliminate the likelihood of a future uncontrolled release of water in this area. Construction of the project is expected to last approximately 18 months. The Water Authority is hosting an open house on Wednesday, August 22 at the Escondido Chamber of Commerce, 720 North Broadway. Attend any time between 6 and 8 p.m. to meet the project team and staff, and learn more about the pipeline relining project. For questions about the project, please call (877) 682-9283, ext. 7009 or email CIPinfo@sdcwa.org. 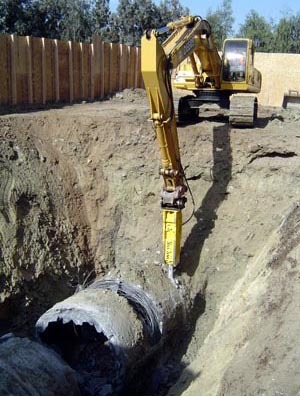 Within this section of the Water Authority’s system, Pipelines 1 and 2 are between 48-inches and 54-inches in diameter. Pipeline 1 was originally constructed in 1947 and Pipeline 2 in 1954. A condition Assessment completed in 2014 determined it was time to replace this section of the system. Project Work Hours: Monday through Saturday from 7 a.m. to 7 p.m. The portal area is graded and prepared for excavation. Overview of portal area with sound walls and fencing installed. Pipe is excavated and broken in preparation for removal. 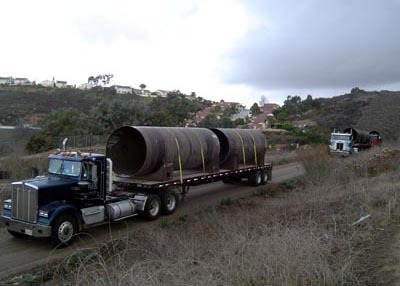 Large diameter pipe is delivered to the site on large flatbed trucks. 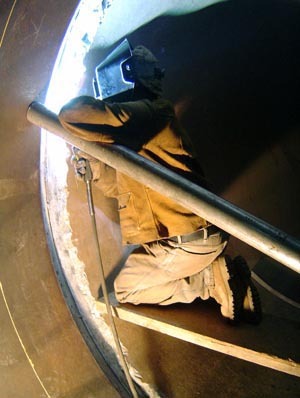 Welders fuse the pipe together inside the trench. 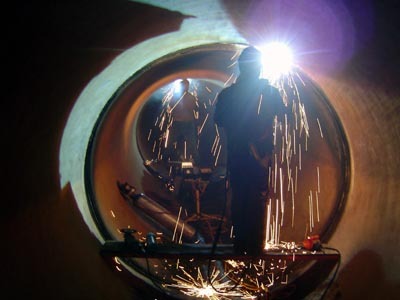 Each segment of pipe is welded together, forming the new pipeline. Large trucks mix the grout onsite in preparation for securing the new pipe to the existing pipe. 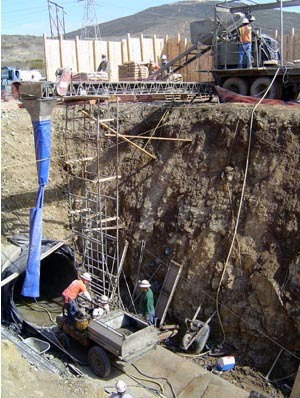 Grout is delivered into the trench using a scaffolding system. 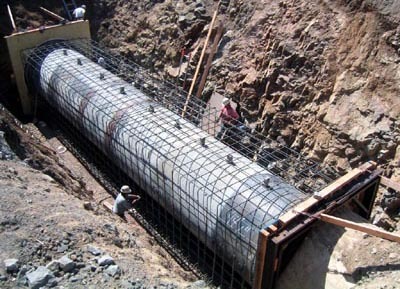 A final section of pipe is put into place. 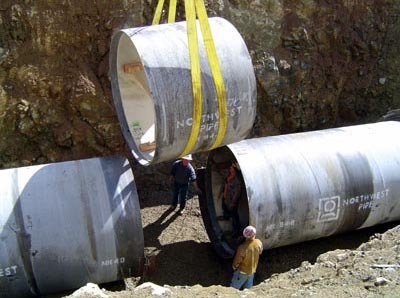 The entire pipe is encased in concrete and rebar prior to refilling the portal. 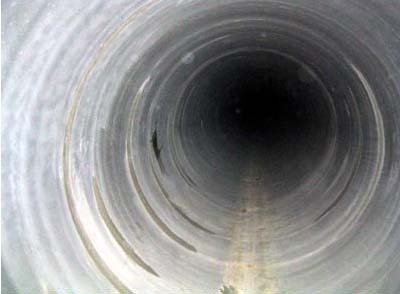 Interior of the pipe after the mortar lining is completed; it is now ready for disinfection and water flow. 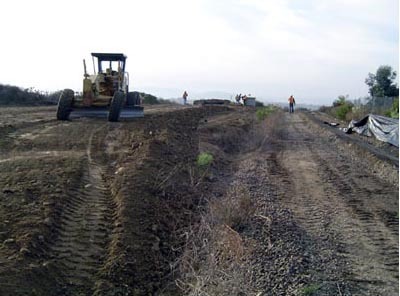 This video below provides an overview of the San Diego County Water Authority’s Pipeline Relining Program. CBS 8's Shawn Styles visited Portals 10 and 12 and compiled this story, explaining the work that is occurring above and below the ground in La Mesa and Spring Valley. This video summarizes a recently completed project near Mission Trails Regional Park. This news story describes an Urgent Carbon Fiber Repair Project conducted in Fallbrook, California. Click lower right corner of graphic for full screen mode. The Water Authority is committed to keeping residents, elected officials, other government and water agencies, businesses, schools, community groups and organizations in the project areas informed about the project. Water Authority staff shared project information at open house and business events and will be providing additional information or presentations to stakeholders as the project moves forward. 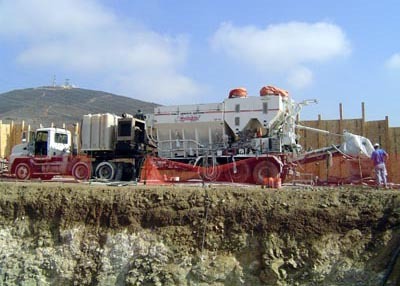 The project belongs to a class of projects which have been determined by the State Secretary for Resources not to have a significant effect on the environment and are, therefore, declared to be categorically exempt from the provisions of CEQA; specifically from the requirement for the preparation of environmental documents. 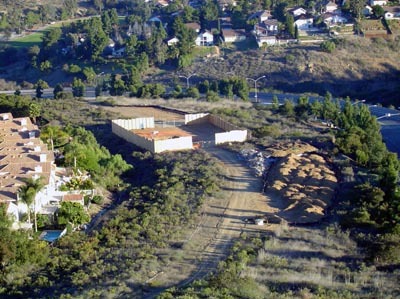 The project fits the definition of Class 1 Existing Facilities (CEQA §15301), which is the repair, maintenance, and minor alteration of existing public structures, facilities, mechanical equipment and topographic features involving no or negligible expansion of existing use. For more information, please call the 24-hour toll-free project information line at (877) 682-9283, ext. 7009 or email CIPinfo@sdcwa.org. A representative from the project team will return your call within one business day.